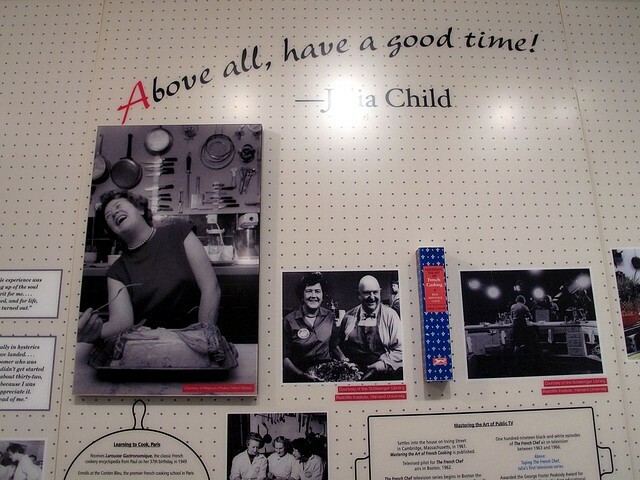 I couldn't pass up the opportunity to visit Julia Child's kitchen while I was in DC last month. Her kitchen, which is now a Smithsonian exhibit, has always meant so much for me. As far back as I can remember I've always known the kitchen through Julia's TV shows, many of which were taped there. I first remember watching Julia in her Cooking at Home series with Jacques Pépin. Later I became a lover of baking from watching her series Baking with Julia. The first time I ever saw Julia on TV, I wondered who is this big woman who talks so funny. But the more I watcher her, the harder it became to look away. I became enamored with her charm, grace, and culinary prowess. Today is the sixth anniversary of Julia Child's death. And this Sunday, the 15th, would have been Julia's birthday. For me this week is all about remembering Julia and her bottomless passion for food and life. She affected the world in such a profound way and changed culinary history forever. It was her hunger for culture that led her to discover the wonders of cooking and baking. She took it upon herself to find herself, her purpose in life, and completed a career change in her mid-30s. Many people would never have the courage to do so. But Julia wasn't afraid to put in the effort and follow her heart—or her gut for that matter. She was dedicated, often repeatedly prepared a dish until it was up to her standards of perfection. That's what passion is all about. After earning her culinary diploma at Le Cordon Bleu in Paris, teaching cooking classes with the cowriters of Mastering the Art of French Cooking, and living in different places around Europe, Julia and Paul decided to settle down and made their permanent home in Cambridge, Massachusetts in 1961. Julia lived and worked there for 40 years. She donated her kitchen to the Smithsonian just before she retired to Santa Barbara, California. Her kitchen was completely disassembled and moved to the National Museum of American History, where it reopened as an exhibit in 2001. Just visiting the museum and walking into the exhibit, you can feel her presence everywhere. Besides the kitchen, there are pictures and stories on the walls of the exhibit and also a video stream playing old interviews and scenes from her television shows shot in the kitchen. But the kitchen is really the star of the exhibit. You see all the work that Paul put into designing the kitchen: choosing the perfect shade of color for the cabinets, which were made to Julia's height specifications and setting up the pegboards with pots, pans, and utensils with outlines to make sure everything had a purposeful place. Good thing Julia donated her kitchen, because after a renovation, her former home has no semblance of her life there except for Paul's wine cellar, which was left untouched. I can't imagine if her kitchen would have fallen to the same detrimental fate. There's just so much to see and lean from it even today. So tonight, when I'm rewatching Julie & Julia, I'll be thinking of all the wonderful work that Julia produced from that kitchen, her books, her TV shows, and her generosity for helping other writers and chefs succeed in a difficult business. I'd like to leave you with a quote from the exhibit, other than "Bon Appetit," and that's Julia saying "Above all, have a good time." In everything that you do—in life and work, make sure you enjoy what you're doing. That's really what Julia did. She was not afraid to do anything she set her mind to and even through cooking mishaps, tough times in her life, or when publishers kept saying "no" to her cookbook, she moved onward and always injected fun into whatever she was doing. Admission is free. Open daily from 10 a.m. to 5:30 p.m. and to 7:30 p.m. during summer.